-Excellent resistance to UV rays, Ozone and temperature extremes. -Primerless Adhesion to PVC, CPVC, KYNAR 500/HYLAR 5000 based paints and coatings,anodized Aluminium most other common building substrates and metals, glass plastics, Composite Panel, Aluminium, Concrete. 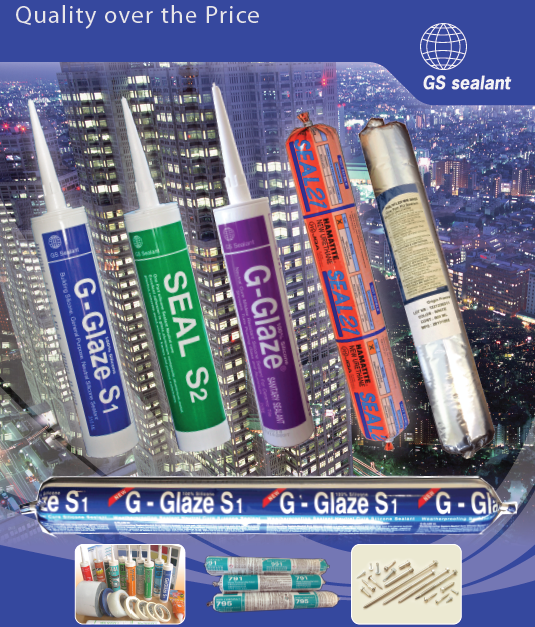 - One component, ready-to-use sealant, Excellent UV, weather and temperature resistance. - Fast skinning and curing. - Excellent adhesion to glass, most metals, and plastics, Composite Panel. > Excellent resistance to weathering, ultra-violet radiation, moisture, ozone, temperature extreme, airborne pollutants,c leaning detergents and many solvents. Has an excellent ashesion to Glass, Aluminium, Concrete, Granite, Ceramics Tiles, Stainless, most plastic, UPVC, Fiberglass, Galvanized and finished Woods. Hamatite New Urethane Seal 21 is a one-componnent new urethane sealing material developed by Yokohama Rubber based on the extensive fund of polymer technology the Company has built up over its many years of experience in the sealing materials business. Combining the advantages of conventional one-component and two-component polyurethane sealing materials, Seal 21 is a completely new type of sealing material for the professional. Concrete, Masonry, Granite, Marble, Brick, Expansion Wall Joints, Panel Walls, Precast Units, Aluminium and Wood Window Frames, lnterior and Exterior. PolyFlex MR3000 is a single component moisture curing, low modulus, paintability, non sagging polyurethane sealant with excellent adhesion property to most construction materials. It ideally uses for expansion and construction joint between pre-cast concrete panel, granite, marble, sandstone, aluminium & pvc joinery, window frames, brick and block work. It can be used for internal and external. ราคาไม่แพง คุณภาพเยี่ยม ขนาด 600 ml.